"So many investors now view ETFs as the foundational component of a well-diversified investment portfolio. 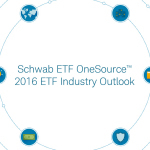 On average, investors already using ETFs are now allocating one-fifth of their total portfolios to these versatile products,1"
SAN FRANCISCO--(BUSINESS WIRE)--Charles Schwab has unveiled The Schwab ETF OneSource 2016 ETF Industry Outlook, an interactive microsite that explores the ETF topics and trends that will be most important to investors and advisors in the year ahead. To view the full report, visit http://www.schwab.com/ETFOneSourceOutlook. The debut of the interactive microsite coincides with the three-year anniversary of Schwab ETF OneSource, the program that offers investors and advisors the most commission-freei ETFs anywhere in the industry. The program was launched in February 2013 with six providers and 105 ETFs. In three years, the program has more than doubled to now offer investors 226 commission-free ETFs spanning 66 Morningstar Categories from 16 providers. 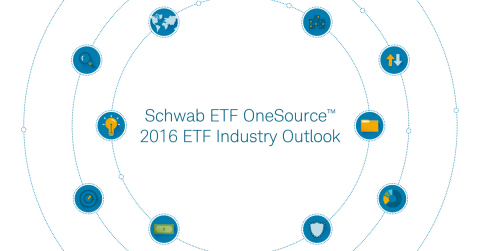 As of December 31, 2015, Schwab ETF OneSource has $48.8 billion in the program and 2015 flows into ETFs in the program are $13 billion, representing 38% percent of the total ETF flows at Schwab. “ETF Securities” is a registered trademark of ETF Securities Limited. IndexIQ® is a registered trademark of IndexIQ. Global X Funds is a registered trademark of Global X Management Company LLC. PowerShares® is a registered trademark of Invesco PowerShares Capital Management LLC (Invesco PowerShares). Invesco PowerShares and Invesco Distributors, Inc. are indirect, wholly owned subsidiaries of Invesco Ltd. ProShares is a registered trademark of ProShare Advisors LLC. “SPDR” is a registered trademark of Standard & Poor's Financial Services LLC (“S&P”) and has been licensed for use by State Street Corporation. No financial product offered by State Street Corporation or its affiliates is sponsored, endorsed, sold or promoted by S&P or its affiliates, and S&P and its affiliates make no representation, warranty or condition regarding the advisability of buying, selling or holding units/shares in such products. USCF® is a registered trademark of United States Commodity Funds LLC. WisdomTree Investments, Inc., through its subsidiaries in the U.S. and Europe (collectively, “WisdomTree”), is an exchange-traded fund (“ETF”) and exchange-traded product (“ETP”) sponsor and asset manager headquartered in New York. Through its operating subsidiaries, The Charles Schwab Corporation (NYSE:SCHW) provides a full range of securities brokerage, banking, money management and financial advisory services to individual investors and independent investment advisors. Its broker-dealer subsidiary, Charles Schwab & Co., Inc. (“Schwab” member SIPC, www.sipc.org), and affiliates offer a complete range of investment services and products including an extensive selection of mutual funds; financial planning and investment advice; retirement plan and equity compensation plan services; compliance and trade monitoring solutions; referrals to independent fee-based investment advisors; and custodial, operational and trading support for independent, fee-based investment advisors through Schwab Advisor Services. Its banking subsidiary, Charles Schwab Bank (member FDIC and an Equal Housing Lender), provides banking and lending services and products. More information is available at www.schwab.com and www.aboutschwab.com. © 2016 Charles Schwab & Co., Inc. Member SIPC. i Conditions Apply: Trades in ETFs available through Schwab ETF OneSource™ (including Schwab ETFs™) are available without commissions when placed online in a Schwab account. Service charges apply for trade orders placed through a broker ($25) or by automated phone ($5). An exchange processing fee applies to sell transactions. Certain types of Schwab ETF OneSource transactions are not eligible for the commission waiver, such as short sells and buys to cover (not including Schwab ETFs). Schwab reserves the right to change the ETFs we make available without commissions. All ETFs are subject to management fees and expenses. Please see Charles Schwab Pricing Guide for additional information.